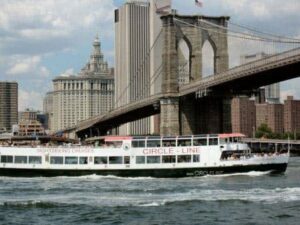 There are a number of boat tours during the day that are perfect for sightseeing in New York. Ranging from tours of just 60 minutes to 2.5 hours, you can decide how long you want to relax on the boat. Many of the tours pass the Statue of Liberty and go under the Brooklyn Bridge – a perfect opportunity to capture great photographs of the city that never sleeps. See the variety of tours below.